The mother of the six-month-old baby who was rescued from the rubble of a collapsed building in Nairobi is among 26 people who have been confirmed dead. Rescuers say the body of the woman was found a few metres from where the baby girl was retrieved unhurt on Tuesday. The presumed owners of the six-storey residence, which came down on Friday night, have been released on bail. At least 80 people are still missing - rescuers say they are still hopeful of finding people alive. The co-ordinator of the rescue efforts, Pius Masai, told reporters that the mother's body was among those that had been retrieved from the debris and taken to a local morgue. 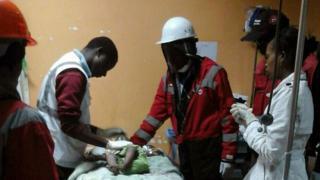 Her baby, named Dealeryn, was found in the rubble at on Tuesday, in a bucket wrapped in a blanket. Dealeryn appeared dehydrated, but had no visible injuries. She has been reunited with her father, Ralson Saisi Wasike, who was at work when the accident happened. Mr Wasike, speaking at a shelter where he has been living since the building collapsed, said his daughter had been strong but he had feared for the worst when he was unable to find her. He said said his wife kept baby Dealeryn in a washtub when she was doing her household chores. The fact that the baby was not seriously injured played a key role in her survival, said Dr Ian MacOnachie, an expert in emergency medicine and clinical standards at the UK's Royal College of Paediatrics and Child Health. Dr MacOnachie told the BBC that, at this age, up to 90% of babies' bodies was made up of water, acting as a "natural storage" in cases of dehydration. "She must have been fairly dried when she was found. But I'm not completely surprised," he said. City authorities say they had earmarked the building for demolition after it was declared unfit for human habitation. Two brothers, believed to be the building's owners, and three government officials were arrested and released on bail. Officials say the owners did not have permission to rent out the building's 119 rooms. The owners have not yet commented.